Lock-in a rate currently 15% lower than Eversource’s supply rate. Guaranteed rate for 12 months – No enroll fees. Risk Free – you can cancel during the rescind period without penalty. *NEW RESIDENTIAL CUSTOMERS ONLY. Town Square Energy is a licensed New Hampshire electric supplier. Customers can cancel their enrollment without penalty any time before five 95) business days from the date of the postmark of their Welcome Letter that includes Terms & Conditions. A $90 early termination fee applies if customer cancels after the rescind period but before the end of their term. 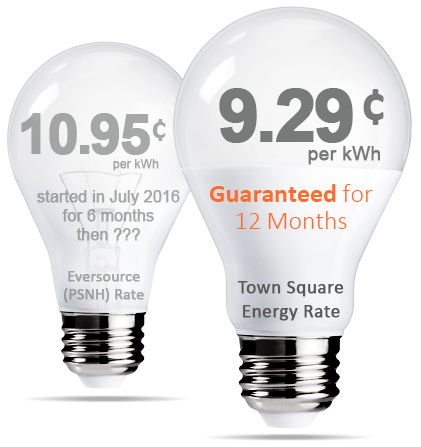 Savings comparison based on Eversource PSNH current rate of 10.95¢ through December 2016. Eversource PSNH future rates are not known at this time. Current rate comparisons are not a guarantee of future savings.